Accurate and efficient radiology billing can prove tricky, especially with so many factors influencing the final outcome. Still, maintaining a healthy revenue stream is possible for any healthcare provider so long as the practice adheres to a handful of best practices. Many of them are fairly common sense but, if ignored, can prove detrimental in the long-term. 1. Communication is key. Encouraging a strong policy of clear and frequent communication between physicians or technicians and coders is critical to ensure the accuracy of radiology billing. A coder needs to be confident that they will be able to confirm the necessity of a procedure or the accuracy of the reports they receive prior to billing, in order to avoid costly and time-consuming mistakes. It's always best to catch a mistake prior to a claim being filed, and one of the best ways to do this is to foster communication among all involved parties in order to decrease the likelihood of a mistake going unnoticed. 2. Many professional fields require ongoing education and certification, and radiology billing is no exception. Coders must continuously update their certification in order to maintain their coding credentials, so it is important to ensure that all billing personnel are educated as to current standards. 3. Education isn't just for the professionals, either. Educating patients as to their responsibility when it comes to billing is crucial for any healthcare provider. For instance, reminding patients upfront that their copay is due at the time of service is one key strategy, as is making clear to the patient exactly what portion of their testing or procedure will be covered by insurance. Pointing patients in the right direction when it comes to assistance in the often confusing claims and reimbursement processes will also go a long way toward ensuring that bills are settled in a timely and satisfactory manner. 4. 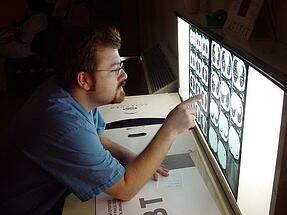 Maintaining an accurate patient database is vital to any medical practice, and radiology is no exception. Not only does this include patient information, but it should also include up-to-date records of the state of the patient's account, so as to avoid confusion in billing and payment. 5. Implementing an audit and compliance program goes a long way toward making the billing process clear and efficient. After all, the more accurate the coding, the more quickly a claim can be processed and the higher the clean claims rate. 6. Working with an outside revenue cycle management company proves in many cases to be a solid choice for radiology practices. Sometimes it's best to leave such tangled administrative tasks to the specialists, and the increased likelihood of having claims and bills quickly and accurately settled can greatly increase the success of a radiology practice. This of course makes the investment in partnering with such a company more than worthwhile in the long run. Using the practices referenced above can go a long way toward ensuring that any practice's radiology billing process will become more streamlined and efficient, thus allowing for greater success for the healthcare provider in question.